Present day residential system is just a replication of the ancient Gurukul system. The college is trying to revive this glorious tradition. Young people are susceptible to became friend-centered. Acceptance and belonging to a peer group can become almost supremely important. In this system, the students cultivate the habits of making friends, adjust themselves with others, develop independent thinking and do their own work. Sai Samarth +2 Science Collegeprovides comfortable hostel facility for boys and girls in the vicinity of the college. Hostels have attached mess which serves delicious food as per the menu by students committee. 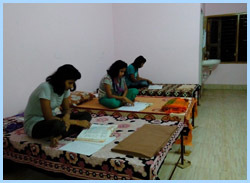 Students have to stay in the hostel to cope with the demanding academic requirement. The freshers (1st year students) are required to furnish applications for admission to the hostel at the time of admission to the college. Application for admission to hostels in the prescribed forms shall be submitted duly countersigned by the parents/ guardians to the Principal, Sai Samarth +2 Science College. Furnishing application for renewal of admission (Readmission) for next academic year by the boarders is mandatory. Application for admission/readmission shall be scrutinized by the Superintendent/ Assistant Superintendent and shall be duly approved by the Principal. Allotment of seats in the hostel depends upon the size of the rooms. Allotment of seats is the prerogative of the hostel Superintendent. However, in case of boarders, who are physically handicapped/unfit or continuously having health problems, special consideration may be given during allotment of seats.